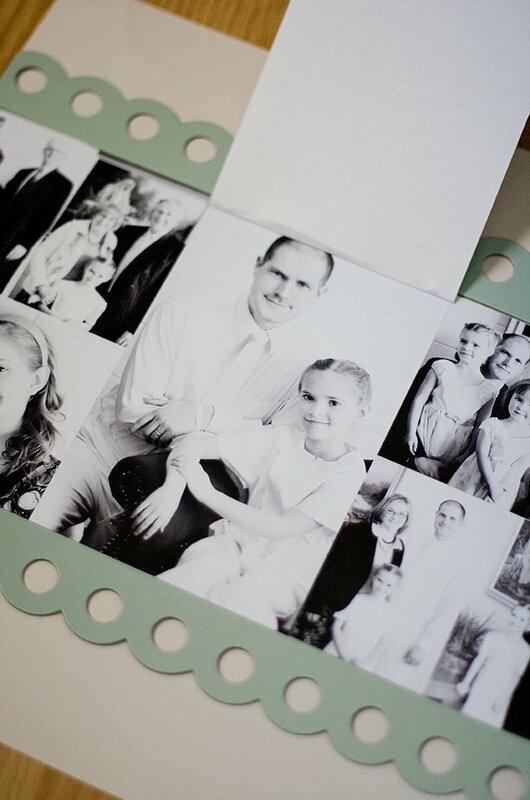 Using smaller/custom sized prints – It Works For Bobbi! 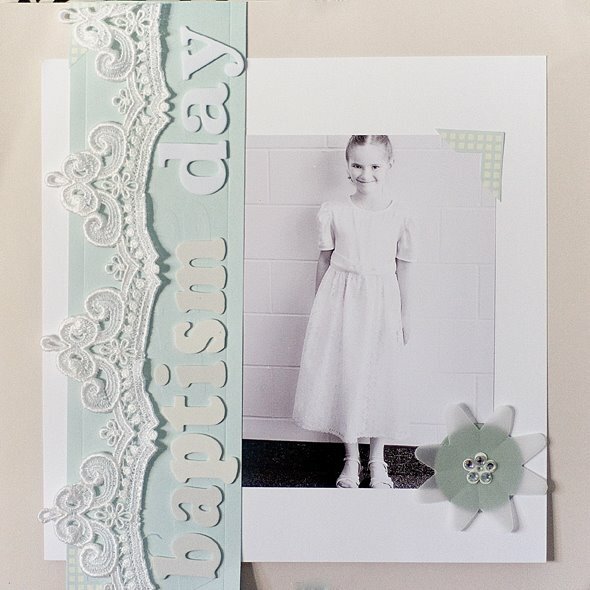 Published on May 21, 2008 August 9, 2016 by Bobbi-Jo G.
Remember yesterday for Tutorial Tuesday I PROMISED I would post a layout using the technique I showed you? I’m delivering! I often take photos of events (which means a LOT of photos) and since my goal this year was to get caught up and STAY caught up, I made myself a promise to (as often as possible) keep the “events” to one 2-page spread. 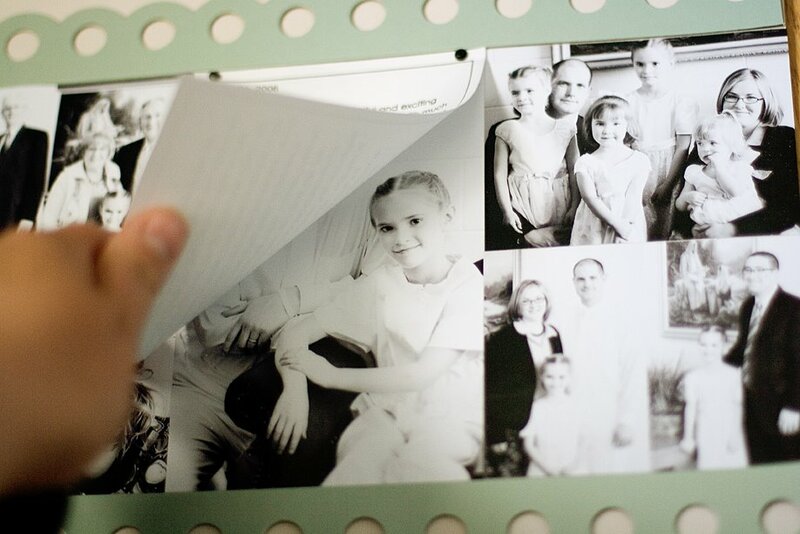 This meant I would have to get creative, be pickier about what photos I included, NOT worry about including EVERY photo, and find ways to hide more photos/journaling. I’ve been very much into the flaps lately – a great way to hide more photos, or your journaling. 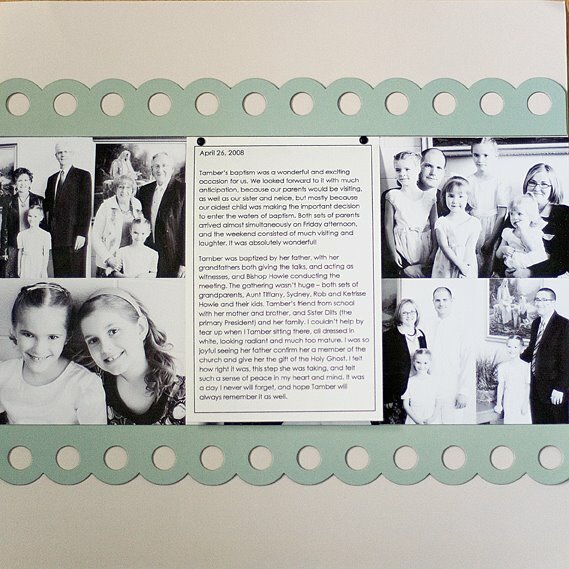 This two page spread was for my daughter’s baptism. The first page, I did a single photo layout. I love these, but it’s hard to justify using the product etc. for just ONE photo. I did make up for it, though, on the second page of this two page spread. And you have one of my favorite 4X6 photos. Voila! 7 photos in the space designed for 3. I could have done a collage in the last space, too, but I wanted to showcase that photo by making it larger. So, I hope you try the technique soon, and make even MORE of your layouts! You are a genius gal! Thanks for sharing, this layout is just wonderful. That is an AWESOME idea! I too wonder what to do with SO many photos of the same event. I love your ideas.